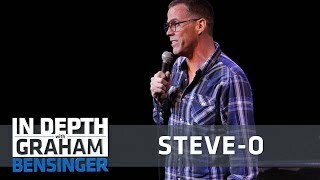 Steve-O (a.k.a. Stephen Glover) is a household name and it all started when he began producing homemade videos of dangerous stunts mixed with comical behavior. Steve-O graduated from Ringling Bros. and Barnum & Bailey Clown College in 1997, and had a career as a circus clown before achieving fame on Jackass and Wildboyz. Since then, he has become a New York Times bestselling author, standup comedian, and actor. His first hour-long comedy special recently premiered on Showtime and performed in the top one percent of all Showtime comedy specials.